This device comes with 24 various length settings that will let you maintain the wanted facial hair style appearing excellent all the time. If you are willing to have a long or short stubble or a small beard, this is the perfect tool for you. The motorized settings control will deliver super precise adjustments starting from 0.40 mm shadow so that the result is always an outstanding and detailed look that you were anticipating. The reason of this company being famous on a global basis is that it is a UK enterprise who products styling products. They also include a range of excellent stubble and beard trimmers. They create products with superior quality materials and people love them because of their customer service and merchandise. They research on ways to lower the cost of their product by utilizing the right methods. All these results in the creation of beautiful styling products from the company. • Lithium-Ion Technology Power: That permits the beard trimmer to have a more reliable and long charge time. • Fully Waterproof: You can use it in the shower because it is 100% safe to get it wet. If you are someone who does not like wet shaving and thinking that this benefit is useless, think again. Being waterproof makes maintenance simple because all you have to do is rinse. Users choose waterproof tools for ease during cleaning. • Rapid Charge feature: It is where you use during emergencies and you can enough power for a single trim. • Suitable for sensitive skin: Not all devices are designed for sensitive skin. If you are in search of a beard trimmer that will protect your skin and keep it away from redness, irritation or pain, this tool is the one. Some people switch to using beard trimmers from scissors or razors because of skin sensitivity. • Somewhat Noiseless: Well, we cannot say that it is completely silent but it makes less noise than many other beard trimmers. You can carry out the grooming session without disturbing others. • Excellent Battery: As mentioned before, the battery is lithium-ion and it is powerful. The charging stand comes with suction feet. It does not have a charging port because the device is waterproof. If you get drops of water on the port, that could be an issue and it will damage your device. 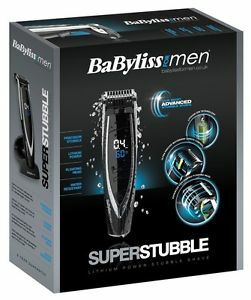 It has the highest run time (70 mins plus) out of its family members such as the Super beard (60 mins), Super Stubble (60 mins), I Stubble Plus (45 mins) and so on. • When you want to think about its disadvantages, there is not anything much expect for you wish you had a travel pouch. In that case, you will be disappointed that you do not have that. The fact is that it does not come with a lot of attachments or accessories, hence there is no bag. The box contains: the beard trimmer, adaptor, cleaning brush, stand and appliance oil. This entry was posted in BaByliss on January 3, 2018 by Professional Beard Trimmer Reviewer.